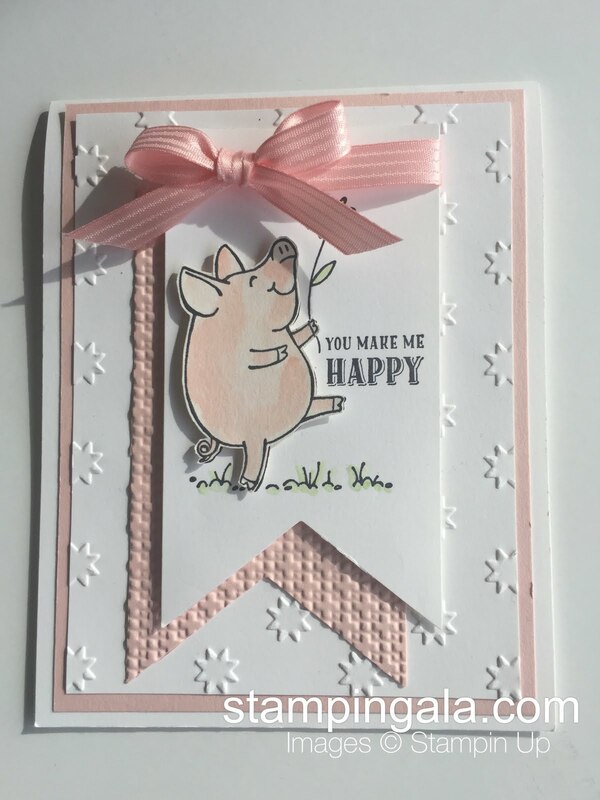 Doesn’t this card make you smile? I designed this card a while back for one of my Breakfast Club Classes. It was such a big hit with my friends that I couldn’t let another chance go by to share it with my readers. I stamped the image with Black Archival Ink on a piece of Whisper White card stock that I had cropped with the Triple Banner Punch. I stamped a second image on a piece of Shimmer White card stock. I watercolored this image with Powder Pink ink using my favorite Aqua Painters. The little piggy is fussy cut and popped up with dimensionals. Here are the products I used to create this card. Click on the products below to order them from Stampin’ Up anytime! !